There is a solid case to be made that the rebooted Planet of the Apes series is the best blockbuster franchise of the 21st century. Other franchises might enjoy higher profiles and bigger box office (Dark Knight trilogy, the Marvel Cinematic Universe, the Harry Potter series), but in terms of consistent high quality, with their combination of incredible technical achievement and effective storytelling, these Apes movies are hard to look past. After the Rise of the Planet of the Apes and the Dawn of the Planet of the Apes, the third instalment, Matt Reeves’ War for the Planet of the Apes, fittingly rounds out this most under-appreciated of blockbuster trilogies. The decision to reboot the Planet of the Apes franchise in 2011 raised a few eyebrows. It felt like a slightly dated concept, and the previous attempt, Tim Burton’s 2001 Planet of the Apes remake, had been a terrible flop. But Rise of the Planet of the Apes proved to be one of the pleasant surprises of 2011, well received both critically and at the box office. But while a successful reboot is one thing, a successful sequel is an entirely different beast. However, expectations have been surpassed again, as Dawn of the Planet of the Apes is an intelligent, thrilling blockbuster which succeeds in taking this franchise to the next level. Ten years after Caesar led his clan of genetically modified apes out of captivity and into the woods outside San Francisco the world looks very different. The ALZ113 virus which was being tested on the apes has become an epidemic, known as simian flu, and has wiped out most of the earth’s human population. Only those lucky enough to have a genetic immunity to the virus survive. A few hundred of these survivors have settled in San Francisco under the leadership of ex-military man Dreyfus and former architect Malcolm. With their fuel running low, their only hope is to get the hydro-electric system at O’Shaughnessy Dam up and running. Doing this means heading into the woods which the apes have made their home. While diplomacy between Malcolm and Caesar allows for initial cooperation, the hot-heads of Dreyfuss and Caesar’s second in command, Koba, mean that tension is never far from boiling over. Dawn of the Planet of the Apes succeeds in going beyond what Rise of the Planet of the Apes gave us. The ambitious film gives us an expansion of scale. Where the first film was mainly shot in interiors, this sequel is shot entirely on location and primarily outside. This gives the picture a grander scope and a more epic quality. It also marks the first time that motion capture technology has been extensively used on location rather than in the controlled environment of a studio, and the results are stunning. While upping the scale, Dawn of the Planet of the Apes returns to the heart of what science fiction is supposed to be. Rather than the simplistic spectacle it so often becomes these days, when done well science fiction uses its fantastical narratives to offer social commentary or insight into the human condition. The screenplay by Mark Bomback, Rick Jaffa and Amanda Silver, wears its political heart on its sleeve, exploring themes of empathy and fundamentalism, tolerance and prejudice. In this war between humans and apes, we are not encouraged to take sides. This is a great strength of the movie. Instead it wants us to see the similarities between the two species. There are good humans and good apes, and there are bad humans and bad apes. Neither species can claim moral superiority. As tensions rise we see that peace requires us to see those things which we have in common, while conflict comes from an inability to see past those things that make us different. Visually, this film is very impressive. The visual effects, supervised by Joe Letteri and Dan Lemmon, are tremendous in both the large scale action sequences, and the minute detail of the motion capture which brings the apes to life. But motion capture, or performance capture, is not just a technical achievement. The film’s strongest characters are simian, not human. The ape characters are both well-conceived and well written. The majority of the communication between them is in the form of a simple sign language, yet the actors use this primitive communication to effectively display complex emotions. Similarly, the film’s strongest performances come from the motion capture actors. Andy Serkis, with his iconic work as Gollum in the Lord of the Rings films, has established himself as the world’s premier motion capture actor. But his performance as Caesar is something to behold. Serkis gives the weary leader of the apes a real gravitas. 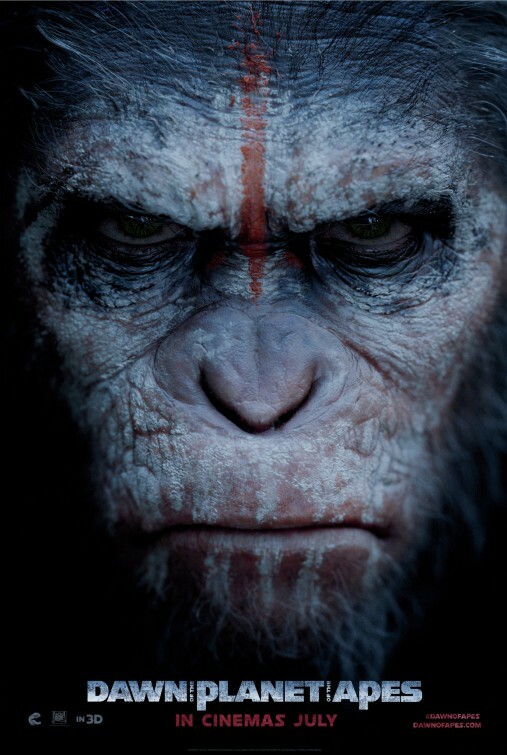 Caesar shows arguably the most complex, subtle emotional depth the cinema has ever seen in a non-human character. While I’m not sure that the Hollywood establishment is yet ready to recognise a motion capture performance with an award nomination, Serkis would not be out of place in that discussion. In an era where the science fiction genre is often merely an excuse for special effects and spectacle, Dawn of the Planet of the Apes aspires for something more. Refreshingly intelligent for a big budget sequel, Dawn of the Planet of the Apes is easily the best blockbuster of the year so far. Have you seen Dawn of the Planet of the Apes? Leave a comment and let us know what you thought. It is fun to be back in Middle Earth and the world of The Lord of the Rings again. It is great to see Ian McKellen back as Gandalf. Andy Serkis again steals the show as Gollum. It is nice, if completely unnecessary, to see Elijah Wood as Frodo again. But be warned, Lord of the Rings this is not, which is unfortunate as it is not going to be able to avoid comparisons. The Hobbit: An Unexpected Journey follows the same narrative formula as The Lord of the Rings. Again we have a motley crew making their way across the countryside, encountering all manner of foe, on a journey to an ominous mountain. However, the problem for The Hobbit is that there just isn’t enough at stake in this story. In The Lord of the Rings you have these grand themes of good and evil at play, and the fate of the world rests on the shoulders of this small company on their mission. In The Hobbit we have a dozen dwarves who want their home and their gold back. It doesn’t quite compare. In The Lord of the Rings, they had no choice but to go on. In The Hobbit you feel like if things really got too hard they could just decide to give up and life would go on. The only times we get a sense of bigger themes at play are in scenes which point towards the events of the events of The Lord of the Rings trilogy. The difference between the two is that The Lord of the Rings is a genuine epic, whereas The Hobbit is a rollicking adventure story. But in trying to maintain a consistent tone, Jackson is trying to force an epic tone on The Hobbit when he may have been better served to have a bit more fun with it. It is a children’s book after all. As an aside, I couldn’t help but notice the similarities between the poster below and that of The Muppets which I hoped may have indicated an attempt to lighten it up a bit, but outside of a couple of moments, not really. Martin Freeman is very likeable as Bilbo Baggins and the better scenes in the film, for mine, feature him prominently, in particular the scene with the three trolls deciding how they will cook up the band of dwarves they capture, and, of course, Bilbo and Gollum’s game of riddles. Richard Armitage is strong and moody as Thorin, but with the exception of a couple you will have trouble differentiating between the dozen dwarves in the band. Unlike The Lord of the Rings where each member of the fellowship had a distinct persona, in this case they are largely interchangeable. When it was first announced that The Hobbit was going to be made as a two part film, and then later revised to three parts, eyebrows were raised. When Jackson made The Lord of the Rings, he took an enormous work, which was already a trilogy, and had to be really selective in terms of what he included and what he left out in order to fit it into a trilogy of films. With The Hobbit Jackson has taken one book, which is significantly shorter than The Lord of the Rings, and has stretched it out to three films, and unfortunately that stretching shows. At 169 minutes, the issue with The Hobbit: An Unexpected Journey is not so much that it is long, but that it feels unnecessarily long. It feels stretched out. I can’t see there being a special extended edition DVD of this film because it is hard to believe Jackson has chosen to leave anything out. Anyone who found the last half hour of Return of the King frustratingly drawn out will find themselves infuriated by how long it takes An Unexpected Journey to get started. First there is a prologue of about 20 minutes which seems to have been put in there solely to get Elijah Wood back on screen as Frodo, and that is followed by another 20 minutes of dwarves arriving at Bag End. So you are about 45 minutes into An Unexpected Journey before the unexpected journey begins. I wouldn’t be surprised if, when the trilogy is finished, a competent reader could read Tolkien’s novel in less time than it would take to watch the trilogy back to back. I didn’t get to see the film in 48 frames per second, but have heard mixed responses to that format. Apparently it is wonderful for the landscape shots, offering beautiful clarity, but that same clarity has a negative effect on costumes and make-up. While The Hobbit: An Unexpected Journey has copped a bit of flak from some critics, and doesn’t reach the heights of the incredibly successful Lord of the Rings trilogy, it is not Star Wars Episode I: The Phantom Menace by any stretch of the imagination. It feels a little drawn out, but once the story gets going there is a lot of fun to be had.